Toddlers love the soothing sounds of Rhyme. Zonderkidz is pleased to introduce a rhyming Bible created just for them! Parents and their little ones can enjoy ten classic Bible stories retold in delightful read-aloud rhyme in The Rhyme Bible Storybook for Toddlers. From the Story of Creation to the Resurrection of Jesus, The Rhyme Bible Storybook for Toddlers is a great choice for parents who want to introduce their little ones to the Word of God. In this padded board book edition with whimsical illustrations, The Rhyme Bible Storybook for Toddlers is certain to become a well-worn favorite. Joyful pictures and classic stories told in vivid verse make this a sure favorite that will entertain your young ones and teach them biblical lessons that last a lifetime. This durable, chunky board book is perfect for little hands that love to help turn the pages. 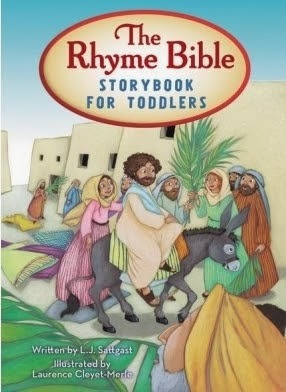 Toddlers will enjoy having their very own Bible storybook to bring to church or cuddle up with during nap or quiet time. The Rhyme Bible Storybook for Toddlers is the fun-time, anytime, read-aloud Bible rhyme! The Rhyme Bible Storybook for Toddlers is available as a padded-cover board book on February 25th, 2014 for $9.99. About the Author, L.J. Sattgast considers writing her joy. She is the author of twenty-five children’s books and has received both the Gold Medallion and C.S. Lewis Honor awards. Linda also runs an online business and lives in the Pacific Northwest with her husband, Charlie. About the Illustrator, Laurence Cleyet-Merle grew up in a green countryside near Switzerland where she always enjoyed drawing. She is a graduate of the School of Decorative Arts in Strasbourg. Laurence uses acrylic, collage, and gouache in her colorful illustrations. She currently lives in the sunny town of Marseille, France with her family. Zonderkidz™, the children’s division of Zondervan, inspires young lives through imagination and innovation. As the leader in Christian children's communications, it creates products that awaken the hearts and touch the souls of kids under 14. Zonderkidz is also publisher of the NIrV (New International Reader’s Version) Bible translation, the third grade reading level edition of the NIV. For additional information, please visitwww.zondervan.com. Rhyming is fun at any age so I am not sure who enjoyed this book more, my 2.5 year old, 6 year old, or myself! :) The author uses a lot of creativity in this book that keeps the reader turning to the next page to see what story is next and find the rhymes. The pictures are fun and colorful so they grab your attention immediately. The book allows you to hear a wonderful Bible story but also have fun finding the pair of rhyming words per page. Thank you Zondervan for supplying me a free copy of this book in exchange for an honest review. I was not paid for this review.